The Perspective of Life From My Side of Window: LIVE in the NOW! Beijing Olympics 2008 has already come to an end. 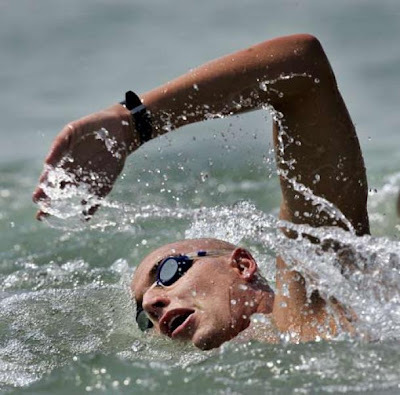 What caught my attention the most about it wasn't Michael Phelps staggering 8 golds or Usain Bolt's tremendous world records but rather it was Dutchman Maarten van der Weijden's gold medal victory in the 10KM open water marathon that left me amazed. He was diagnosed with leukemia in 2001 but that didn't stop him from winning. He said the leukemia has taught him to think step-by-step and patience because when you are lying in a hospital bed with pain and agony, the last thing you want to think about is what will become of tomorrow. And that's when it hit me right in the head. We, sometimes worry too much about what would happened in the next day, years and decades to come that we forget to live in that particular moment. Stop worrying too much about tomorrow because tomorrow will never come if we don't live through today so take each second and day as it comes and make the best out of it. Only if you truly live in the 'NOW' moment can you have a memorable past and a beautiful future.